Manta, Ecuador - our first port in South America. Our surroundings, while unfamiliar, still had a familiar look to them. The style of building communities behind walls was reminiscent of Egypt, as are the half-finished buildings. Manta is a deep water port, which makes it ideal for shipping. It is also the tuna-fishing capital of the world, according to our guide. The design of the fishing boats, with their cranes makes it clear that fishing is a serious industry here. The cranes are used to lift the fish out of the ship’s hold. 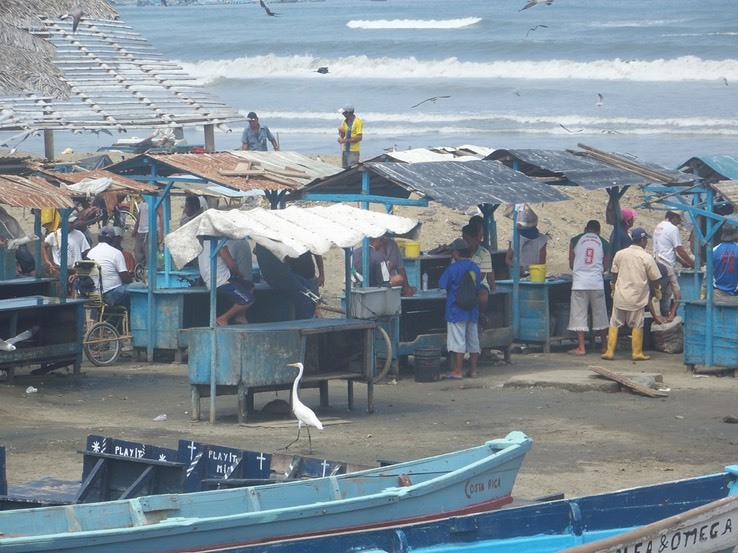 It was a surprise to see the fish market (photo below) still partially in operation around noon. Of course the area was swarming with birds - the usual pelicans and seagulls, along with large numbers of magnificent frigate birds, and even a few egrets! Our tour took us first to a small but very nice cultural museum that holds artifacts from the very early cultures of the area (dating from 7,000-9,000 years before Christ! ), as well as some modern art. Following this we went to the village of El Chorillo, where we were introduced to the last family in Ecuador to work with sisal, an agave fiber. They make bath mitts and back scrubbers from the fiber, as well as burlap sacks for coffee, rice etc. They have an interesting loom that throws the shuttle automatically - when the loom operator pulls a rope. He is constantly working that rope and foot pedals to weave the fabric. The process is otherwise pretty primitive, but interesting to watch. 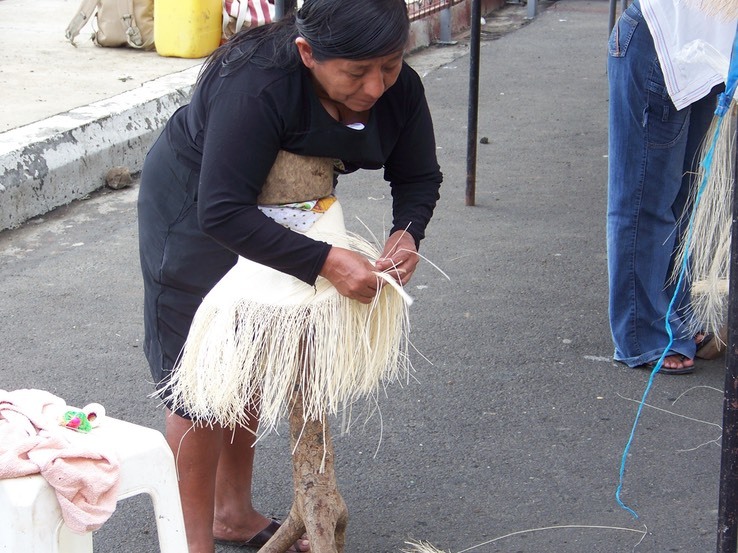 Our next stop was in the village of Montecristi, the birthplace of the Panama hat. The hats got their name because they were used by workers on the Panama canal. As with the burlap bags, we saw the process of hat making (see photo above) from the fiber-producing plant to the finished product. Across the street from the tent with the hatmakers was a row of booths selling various local handicrafts; almost all the booths were selling Panama hats. There were different styles and qualties, with prices varying from $5 (we didn’t see any of those) to about $1000, for the hats made with very fine fibers. Of course we each got a hat. It was difficult to decide where to buy one because the selection was somewhat different in each place, and by the time we’d been to all of them it was difficult to remember where we’d seen the ones we liked. The final stop on the tour was at a factory that makes carvings from Tagua nuts. The Tagua nut is also known as vegetable ivory, due to the color, and the fact that it becomes very hard when sun dried. The nuts come from a palm related to the coconut palm. When our bus drove through the factory gate we were greeted with the sight of large quantities of drying nuts, as well as a flock of turkeys and a few chickens. Inside the very high-roofed building we found one man carving the nuts. There was a line of people slicing the nuts, and another line of people stamping buttons out of the slices, and a small group of women sorting for quality. They also had some display tables at the other end of the building, filled with the buttons and carvings of animals. They were not expensive so we bought three of the carvings. We learned that until the current economic crisis all the fashion houses in Italy insisted on using only Tagua nut buttons. The landscape in the area around Manta is described as “dry forest”. The area receives only about an inch of rain per year, so the plants are specially adapted to the environment. There are cacti, of course. The ones we saw were called candelabra cactus. The other very noticeable kind of vegetation is the kapok trees, which are also known as barrel trees, for the strange shape they acquire as a result of storing water for the dry season. The fluff in the pods was used to stuff pillows and the like before the advent of polyester. Although the poverty in this area is very noticeable, the people seem happy, and they are very friendly. We enjoyed our short visit to Ecuador and are interested in seeing more of the country.